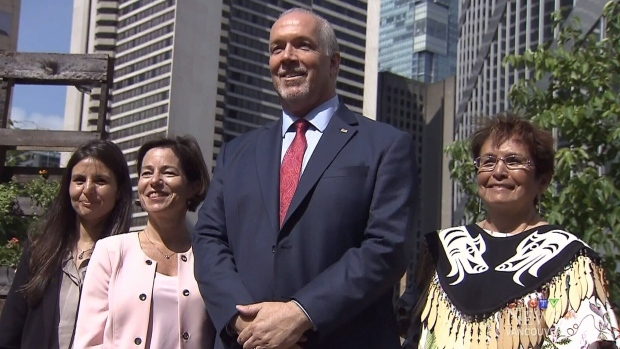 File photo: From left to right, Gisele, a survivor of domestic violence, Minister for Municipal Affairs and Housing Selina Robinson, Premier John Horgan and Musqueam Nation elder Jewel Thomas at a news conference announcing new funding for women escaping domestic violence. May 25, 2018. VICTORIA - The majority of women and children fleeing violence across Canada are not getting the help they need because of a lack of safe housing, says a national group that advocates for an end to violence against women. Women's Shelters Canada executive director Lise Martin said Thursday surveys of a 24-hour period have been done every year since 2014, and the latest one found 404 requests for help, but only 100 women and children were taken into a shelter. She said the results for the past four years have suggested up to 75 per cent of those seeking housing aren't getting it. But British Columbia is starting to offer some relief for women and children with plans to build 280 new transition homes in 12 projects located across the province, Martin said. Housing Minister Selina Robinson announced the 12 projects Thursday as part of the government's investment of $734 million over the next decade to build 1,500 housing spaces. Martin said the availability of longer-term transition housing gives women and children more comfort and time to work at building new lives away from the threats of violence. “Some of our work is supporting women to go from defensive survival mode to being able to develop a perspective that sees exactly what has happened and to overcome the fear and guilt and believe in the possibility of a life in which they can feel safe and valued,” she said. Makenna Rielly, of the Women's Transition House Society in Victoria, says construction of 20 second-stage housing units in the suburban community of Langford would allow women and children a safe home for up to 18 months so they can transition to a new life. She said many women return to violent homes because they cannot find suitable housing. Among the 12 government housing projects are 10 beds at Vancouver's Salvation Army for women who experienced human trafficking and exploitation, 40 units of second-stage housing in Kamloops run by the Elizabeth Fry Society and in Kitimat, 12 transition housing beds, 10 units of second-stage housing and 20 affordable rental homes.